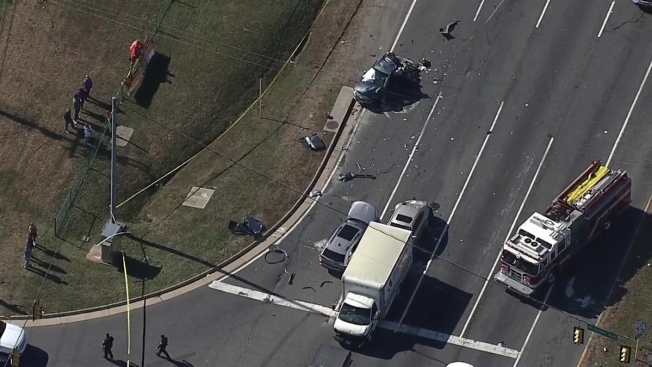 A tractor-trailer driver is facing an involuntary manslaughter charge after he slammed into traffic stopped at a red light in Fredericksburg, Virginia, killing one woman and injuring three others. James Edward Lee, 62, was traveling in the center lane when he abruptly pulled into the right lane and plowed into traffic stopped at the intersection of Route 3 and Gateway Boulevard Thursday morning, police said. There is no indication he attempted to use his brakes, police spokeswoman Sarah Kirkpatrick said. Six vehicles were involved in the crash. Shari Laney, 54, of Spotsylvania was killed. Three other people were injured, including a Laney's fiance's 80-year-old father who was in the passenger seat. He remains in critical condition, Laney's fiance told News4. Laney was a mother of two. "We're hurt. We're in shock. We're in grief and we're angry that this could happen. She was doing everyting right and she was just sitting at a stoplight," Laney's cousin Robin Taylor told News4. Taylor came to the scene of the crash Friday with Laney's sister. They wanted to see the intersection where their loved one died. Laney had moved to Spotsylvania a couple of years ago and reunited with her high school sweetheart. "She was happy. Yeah, she was happy. Happiest she had been in a long time," Taylor said. Laney was a dedicated caretaker to her fiance's father. Taylor said the role fit with her personality. "She had such a big heart. She had a big heart. She would turn nobody away. She wanted to help people, she wanted to make people happy who were around her. If she saw a need that you had, she would fulfill it if she could," she said. Lee was also injured in the crash and remains hospitalized. He has been charged with involuntary manslaughter and reckless driving.